In Pottery > European Art Pottery > Show & Tell and Art Deco > Show & Tell. A Saturday morning "early-bird" purchase just a year ago. I had just arrived at the market when I saw the figure. I bought her, put her in a box and safely got her home on a bus. She is a terra cotta figure, slip cast, partially glazed with gilded hair and hand-painted decoration to the face. She is 16.1 ins or 41 cm tall. Josef Lorenzl designed her for Goldscheider in 1939. My figure is later for sure, when Germany used pre-war designs to get back on their feet. The form is called "adagio" which means 'at ease'. I think it refers to the slow, enfolding movement of a dancer leading to an extension of the leg. It's meant to grab attention with a breath-taking gymnastic leap or leg extension. I'm still shocked that she has survived this long in perfect condition. People have been looking after her well for the last sixty years. I mean to keep it that way. Hey Tucker, thanks for the comment and encouragement! She is absolutely gorgeous vet !!!!!!!!!! Many thanks Manikin and czechman too! What number does the base stamp have? Is it made in Austria or Germany? She is marked with a black stamp Goldscheider and West Germany. 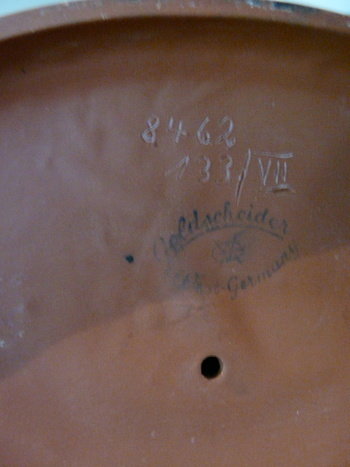 Incised into the clay is 8462, underneath that is 133 VII. She retains her original silver sticker as well on the front of the base. By the way your Hagenauer figures and the Susi Singers are fabulous! Many thanks BluVamp & walksoftly! PICTURES 2 AND 3 ARE ALMOST THE SAME; PLEASE EDIT AND TAKE A PHOTO OF MARKS WHENEVER POSSIBLE; THAT WOULD MAKE DISCUSSION MORE INTERESTING. Sorry Ivan49. I'll take another picture and post it for you! Hi Ivan! I've put in a photo of the base. I've found a similar terracotta figure 8462 which sold at Bukovskis in Stockholm, 5 May 2011, lot 886. They give a manufacture of 1953 - 1960. The original model was designed by Lorenzl c/1939. Many thanks the dove67, guyfrmatl, BluVamp. 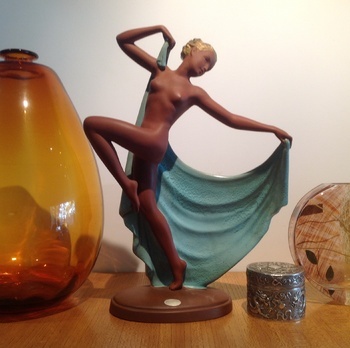 walksoftly, AmandaAddamsAuctions, rocker-sd, Manikin, czechman, peteeone, BELLIN68 & AmphoraPottery too! My apologies for having just caught up! Many thanks eye4beauty & Slave-to-glass too! Many thanks inky, ho2cultcha & PhilDavidAlexanderMorris too! Many thanks nldionne! My hippy days were more swathed in tie dye! Adagio is a ballet pose. They move to a certain point, hold it for just that moment to sink into the memory and move on to another motif. Here in Oz I knew of the hippie movement in the US. I was still at school, rebelling and reading about the changes sweeping the world. Music was a means our generation used to unite across the planet before the times of the global net. Things were so different. Everyone loved one another back then. Now the world hates and distrusts. We considered everyone our brother and sister. Many thanks pickrknows and Phatbuddha too! Many thanks Phatbuddha and to you too Sean! There has been a lot of reshuffling since she arrived! It's a stellar piece of art, great form and condition. I'd have it on my coffee table in a heartbeat!! Love it ! On the net there is one available in Germany I think. No, I just checked it sold through Bukowskis in Stockholm. Mine has gilded hair and a painted face. Many thanks SEAN, freiheit and BHock too! Many thanks RLWINDLE, SMIATA, MSL & SARAHOFF too! Many thanks peteeone and Manikin too! Vet they used a figure very close to your's as a Ad mannequin for Venus Lingerie. Thanks MANIKIN! I'll have a look. Mani I just had a look at the drum majorette! What a stunner! A pinner's delight! Missing part of her baton! What did they call those girls who could spin a baton? A Majorette Vet . She lead the band in the march . Isn't she similar to your beauty and did you see her price ! A majorette is a person doing choreographed dance or movement, primarily baton twirling associated with marching bands during parades. It derives from girls' involvement in the late 19th and early 20th centuries in drill and gymnastic teams or groups that used apparatuses similar to those found in rhythmic gymnastics. Majorettes can also twirl knives, fire knives, flags, light-up batons, and fire batons. They do illusions, cartwheels, and flips, and sometimes twirl up to four batons at a time. Majorettes are often confused with cheerleaders, when in fact, baton twirling is more closely related to rhythmic gymnastics rather than cheerleading. She has just taken over the house! When I bought her I got her home on a bus. I did not have a car. I protected her in a box and very gingerly got her home. Travel and Goldscheider is a worry! Many thanks VRGDC, HO2CULTCHA, NORDICMAN 'n VINTAGEFRAN too !!!! 3 years oldest since you posted her... I just discover this beauty! Superbe! I've been on CW a few years now! Many thanks SEAN & MOONSTONE !!!! !!!! Many thanks VEGASII & RUSTFARM !!!!! Many thanks GEODEGEM & ROYCROFTBOOKSFROMME too !!!!!! Many thanks EFESGIRL & MARTIKA too !!!!! Hi Vetra. Must have been before my time here. LUV it ! Thanks again BB & GWENDOLYN too !!! !!! !!!! !!! !!! Many thanks KYRATANGO !!! !!!! !!! Many thanks LEE !!!! ! !!!! Many thanks THOMAS & GEODEJEM !!!! Many thanks BUCKETHEAD !!! ! !!! Many thanks MCHECONI !!! ! !! !